The first time I ate kimchi, I totally fell in love. Unfortunately, after a few more kimchi dining experiences I learned that I was in love with something very un-vegetarian. Most kimchi that you’ll find at restaurants is made with some type of animal product, usually fish sauce or shrimp paste. Who knew? Isn’t that the story of every vegetarian’s life? That oopsie moment just happens to be after discovering your new favorite food. It was a huge bummer, but I was able, on occasion only, to locate veggie friendly kimchi at the supermarket, which only fed my addiction, in turn making things worse. I had to learn to make my own kimchi. Fortunately DIY vegan kimchi need not be that difficult. 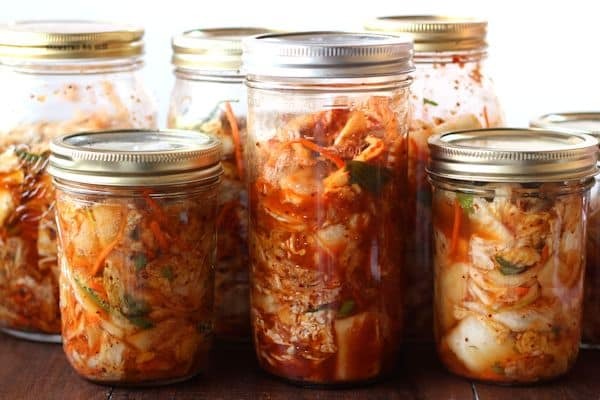 Yes, traditional homemade kimchi involves can be a bit involved, with steps like burying the kimchi pot in the back yard while your kimchi ferments, but then again, traditional kimchi also involves fish sauce. So we’re just going to go for flavor and let a few things slide. You’re going to need a large pot, mixing bowl, cutting board, knife, and a few mason jars totaling about a quart in volume. Make sure everything is very clean. I guess this is obvious, but it’s especially important here, because you don’t want to introduce any undesirable bacteria that could interfere with the fermentation process. 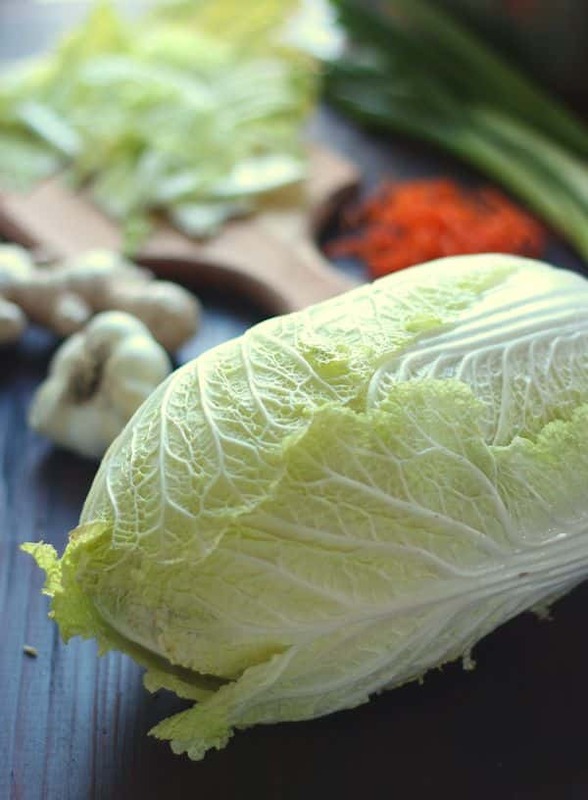 You’ve got some flexibility as far as ingredients are concerned, but one thing that’s essential is a head of napa cabbage, so start with that. One medium sized head of napa cabbage will give you about a quart of kimchi, which is a good size for your first batch. In addition to your napa cabbage, you’ll need a half cup (yes, this is a lot) of non-iodized salt, a tablespoon of sugar, one to two tablespoons of grated ginger, about four to six garlic cloves, all minced, and four to six scallions, cut into one inch pieces. The other essential ingredient is hot chili powder. For an authentic kimchi you’ll want to use gochugaru, or Korean red pepper flakes, which you should be able to find at an Asian market. I have substituted cayenne and even Indian chili powder in a pinch, and though this might be considered a cheater’s kimchi, it was just as delicious as anything I’ve ever gotten at a restaurant. Be mindful of the amount you use, as different varieties of chili powder have different heat levels. Whatever variety you go with, have a good amount on hand, as you’ll be using between 1 tablespoon and 1/3 cup per batch, depending on how spicy you’d like your kimchi to be. I’d stop here if this is your first batch of kimchi, but once you’ve got a feel for the process and an idea of what different blends taste like, feel free to improvise. I sometimes like to add a half of an onion, sliced into thin strips, or a half cup or so of julienned or shredded carrots. When I made the batch shown in the photos for this post I included a Granny Smith apple for the first time ever, and was pleased with the result. Start by cutting the napa cabbage leaves into 1 to 2 inch pieces. You can do this by tearing them up by hand or chopping the cabbage with a large knife. Remove the core and any very thick pieces towards the base. Place your cabbage pieces into a large pot or bowl. Here’s were that half cup of salt comes in; you’re going to dissolve it in about a gallon of water. 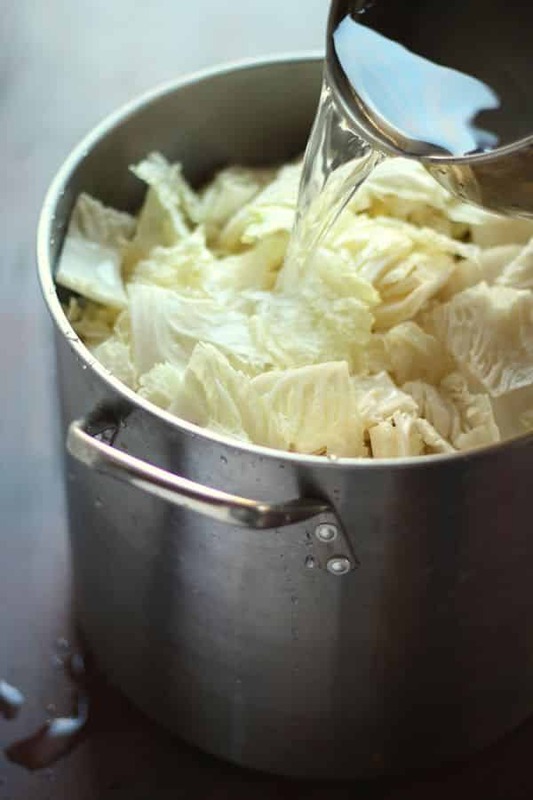 You can heat the water if necessary to do this, but make sure you let it cool back down before going any further, otherwise you’ll start to cook your cabbage and kill off the bacteria that’s needed for the kimchi to ferment. Once your water is at room temperature, add it to the bowl or pot with your cabbage. The cabbage should be submerged; if it’s not, add a bit more water. If you have a large plate that fits into the pot or bowl, place it in there and push down to help keep your cabbage submerged. Let the cabbage sit like this for at least two hours, but no more than twenty-four. This process will wilt the cabbage and start the fermentation process. After the time is up, drain everything into a colander and rinse the cabbage well to remove the salt. 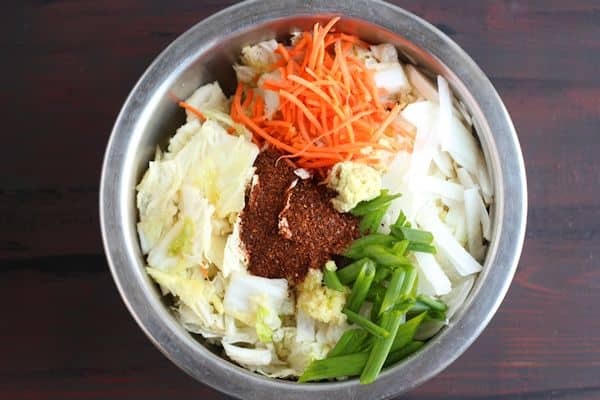 Transfer your cabbage to a large mixing bowl, along with whichever other ingredients you’ve chosen for your kimchi. Mix everything well with a large spoon. You can even dig in with your hands, but definitely sport a pair of gloves if you do, so as to avoid burning your skin. Add up to a quarter cup of water to help the mixing process along. Divide the mixture into mason jars, leaving at least an inch of headspace between the kimchi mixture and the top of your jar. Be sure to include any liquid left at the bottom of your mixing bowl in your jars. Pack the kimchi mixture down lightly with the back of a spoon. Let your jars sit at room temperature for anywhere between two and five days. After about 24 hours you should start to see signs of fermentation like bubbling and the mixture rising up a bit in the jars as gas develops at the bottom. Open the jars about once a day to let some pressure out and press the mixture down to keep as much of it as possible submerged in liquid. Because it’s fermented, kimchi will supposedly last for a while in the refrigerator, but I generally try to use mine up within a month or so. Keep in mind that it will continue to ferment slowly and get more sour over time, even under refrigeration. 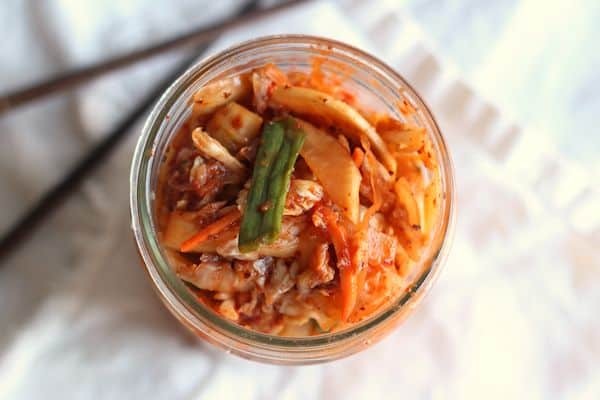 What should you do with your newly fermented kimchi? Traditionally it would be served as a side dish with Korean cuisine. I’m inclined to eat it straight from the jar. You can also use it as a condiment, piling it on top of a veggie burger or on a sandwich. I love kimchi, and your tutorial has inspired me to give it a whirl in my own kitchen. I have always loved the fermented flavor without the fish flavor, so I think this recipe is right up my alley! I’ve always wanted to make my own kimchi and now I think I finally will!! Thanks for sharing! Can you tell me what did you use to substitute fish sauce? Hi Keri! I don’t usually feel like I need anything to replace the fish sauce, since kimchi has so much flavor without it. You could try a little soy sauce or miso if you want to add some saltiness and savory flavor though. I’ve also seen recipes that call for a little bit of nori.